Sudden aggression seems, to Harry’s owners, to come from nowhere. They took the German Shepherd on in good faith five years ago, at the age of two, little knowing what they had let themselves into. 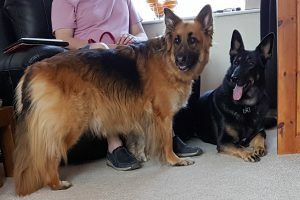 The couple are experienced German Shepherd owners and have stuck with it. The other day, seemingly with no provocation at all. The lady was by herself and both dogs were asleep on the floor. With no warning, Harry suddenly attacked their other Shepherd, Bomber. He grabbed the younger dog’s neck and shook him violently. Reinforcing Unwanted Behaviour. Rewarding Barking. They do what they can to stop young Basset Hound Bentley doing unwanted things like jumping at the table and barking for attention. In fact, they are instead reinforcing these very things. Whilst reinforcing the unwanted behaviour by ultimately giving Bentley what he’s asking for, they also try discipline – ‘NO’. Confused, Bentley can get cross. They do all they can for Winston but his behaviour is a challenge for the young couple – as it would be for most people. They simply can’t cope with his manic evenings. Anything repeated often enough can become a habit. 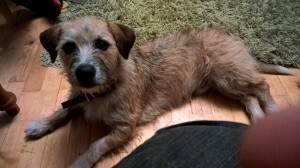 I totally fell in love with scruffy ten-month-old Jack Russell mix Max yesterday. I had the perfect evening with him and his humans. It began with just me and the daughter who is in her late teens. Then mum arrived followed by tw o male school friends of the girl’s and later a man – all people closely involved in the dog’s life. Lucky little dog! As each person joined us I was working with Max. He had jumped up at me in a madly friendly fashion as I walked in the door and I immediately showed him that this didn’t work with me if it was my attention he wanted. More importantly, I concentrated on showing him what did work. As more people arrived and as I worked with him, instead of jumping up at them, becoming increasingly excited and silly as would normally be the case, he was becoming more and more settled. When finally the man joined us, he said Max must be another dog. It won’t take much of this to build up a new habit when people arrive, so long as everyone is consistent. They have a lot of people coming and going so training the humans is the main problem here! All I did was to consistently reinforce the behaviour I wanted. As you can see from the photo, Max became FOCUSED! He was sitting looking up at me as we all chatted. From time to time I reinforced the continued calm behaviour with Yes or a click and the tiniest bit of food. Now he can develop a new habit, that of sitting at someone’s feet looking adorable in order to get his attention fix! 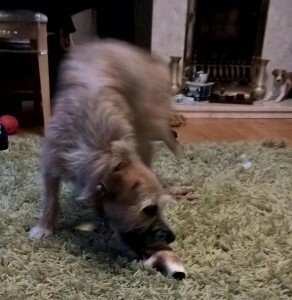 I then tried him on an antler chew. Chewing is such a great and natural way for a dog to relieve stress and to occupy himself. Max worked away at it for maybe an hour after which he simply lay down and settled. 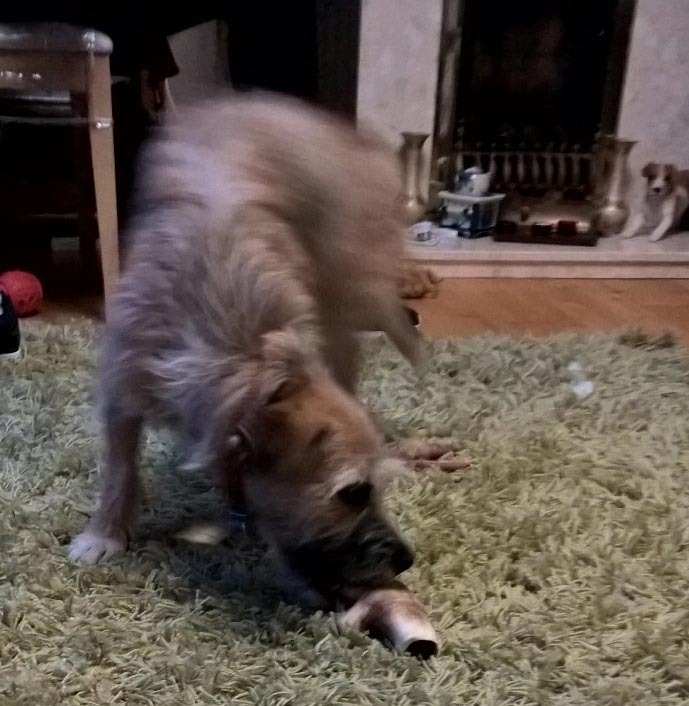 Just like so many dogs I go to, Max generates nearly all his own attention with tactics like constantly asking to be let out and then back in again, jumping up behind people, mouthing, digging the sofa – anything he can think of. If instead his humans initiate frequent short activities that he finds rewarding and that exercise his brain, he will no longer be driven into goading them for the attention and action he craves. They can convert any unwanted habit into a good habit. The small dog has fantastic humans in his life who have put time and effort into teaching him training tricks. Now they need to incorporate work on keeping him a bit calmer and making the desirable habits the rewarding ones. Here are a few examples where his bad habit can be changed into a good habit. Before bed and before they go to work, like so many dogs Max will refuse to come in from the garden. With a bit of management by way of a long lead so he can no longer rehearse the behaviour and food so that he’s motivated, this habit can soon be changed to him running in as soon as they call him. 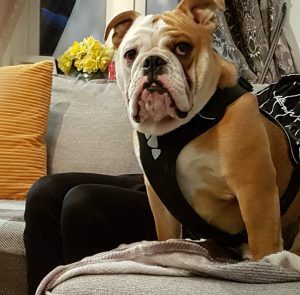 While they eat their dinner, he has a habit of sitting on the back of the sofa behind them and trying to get their food! This habit can be changed with a mix of management and training. So he can no longer rehearse this behaviour he can be put somewhere else while they eat. He can then be taught a much better habit instead. Whenever he sees a person out on a walk he will jump up at them. This habit can be changed through a mix of management and teaching him something better that earns him fuss. Even pulling on lead is a habit. He is forced to walk beside them and the short lead is tight so that pulling against it is constantly rehearsed on every daily walk. A new habit can be established using management – better equipment – and a loose leash that is repeatedly reinforced by earning him forward progress along with plenty of encouragement, attention and reward. Near the end of our session yesterday I put one of my Perfect Fit harnesses on Max and attached a training lead. Within a few minutes the now calm Max was walking beautifully for me and then for the daughter outside the front of the house. Already a new and much better walking habit has been born. It was quite touching how he was with me by the time I was ready to leave and we had removed the harness. He lay beside me, his head on my foot. What had I done to him? We had a mutual understanding. Max felt quietly understood. I have just been to two lovely little dogs, a Westie and a Miniature Pinscher. Both bark in a frenzy when someone knocks on the door. Westie Jock barks non-stop when out on a walk. I group barking roughly into four types – one when the dog simply wants something, another when the dog has been trained to ‘speak’. Then there is barking in play. 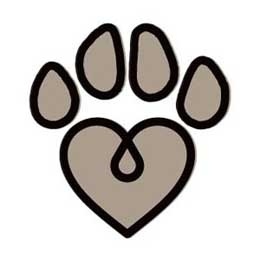 The fourth and most common type of barking that I go to help reduce is what you could call ’emotional barking’. German Shepherd Kerry is bored. 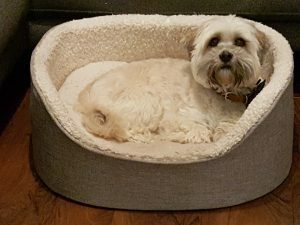 Although it’s natural for adult dogs to sleep for up to eighteen hours a day, this is only so if the rest of the time is filled with stuff natural to the dog – and its breed. Sleep probably won’t be in long blocks of enforced inaction during the day, but dozing between doing other things. Young dogs in particular need action and fulfilment (just like young humans) or they get bored. 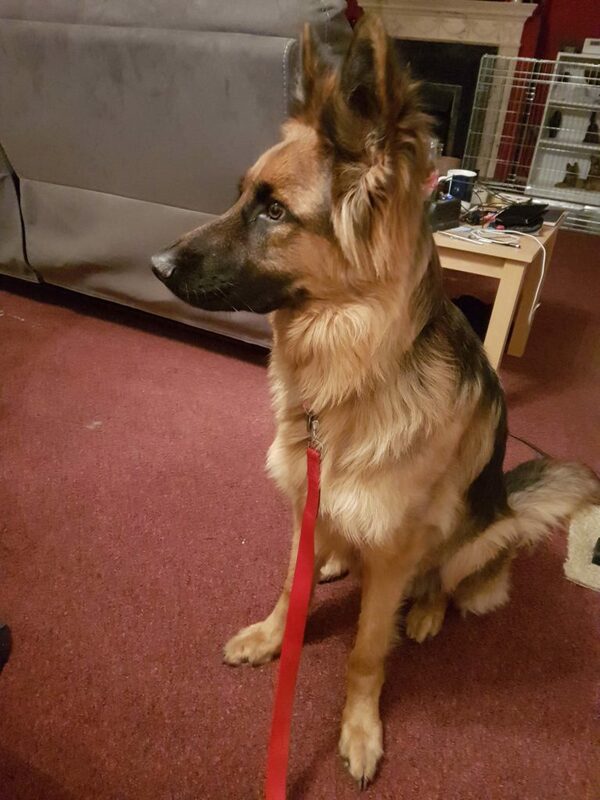 Kerry is a beautiful eighteen-month-old German Shepherd living with another GSD, Lemmy, aged four. They are both gorgeous dogs with lovely, friendly basic temperaments. Young Kerry, unfortunately, probably isn’t getting enough action in her life and she’s very easily aroused. I saw this by how the smallest thing results in her leaping at someone, me in this case – grabbing my clothes and even hair with her teeth. 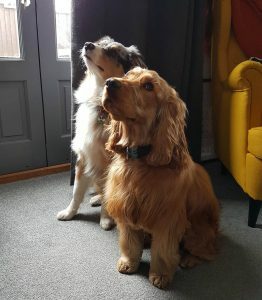 They have done wonderful work with their two beautiful dogs, 18-month-old Cocker Spaniel Pudding and their eight-month-old Australian Shepherd pup. Both are obedient and polite and were it not for Pudding’s recent ‘defensive behaviour’ problem rearing its ugly head, all would be well. The young owners are fortunately now nipping this in the bud. Dog Scared of the New Puppy. Growled. Defensive. Hid. Poor little Lhasa Apso Max is scared of the new puppy. 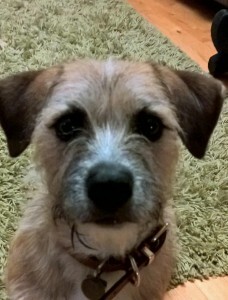 He is a great little dog with a wonderful temperament, but for four years he has been a much-loved Only Dog. Things have already come a long way in the couple of days since they brought Frenchie puppy Brie home. Max’ first reaction was to growl in a defensive manner. He then ran away and hid. 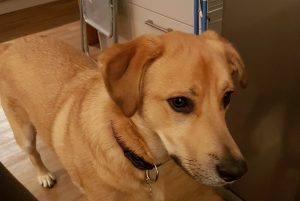 His family had assumed he would love her because generally he’s very happy with other dogs. Scared of the new puppy.